Was I right to reject this edit? Edit review for "Why does everyone in Firefly speak Chinese?" I rejected the edit as it did not seem to contribute to the answer. Was I right to do so, and what guidelines should I be following to make these judgements? I would say you made a good choice. At least one other user (Wad Cheber) agreed with your assessment, as do I. As you can perhaps tell, most of these involve judgement calls to some degree. As you gain more experience reviewing edits, you'll develop an intuition about what does and does not make a good edit. Don't be afraid to use the "skip" button. There's no penalty for skipping a review, and it's much better to do that than to commit to a review you're not sure about. A rule of thumb: If someone took to meta to protest your decision, could you justify it? If not, skip. You were absolutely right to reject this edit. The addition was basically a commentary and pretty darned rude to boot. [although one could argue that "high education" and "high capital" aren't exactly the first things that come to mind when someone mentions America]. The reason for your rejection is personal preference, but I'd class it as vandalism as it might confuse readers into thinking that this was the OP's opinion, rather than something that had been added later. 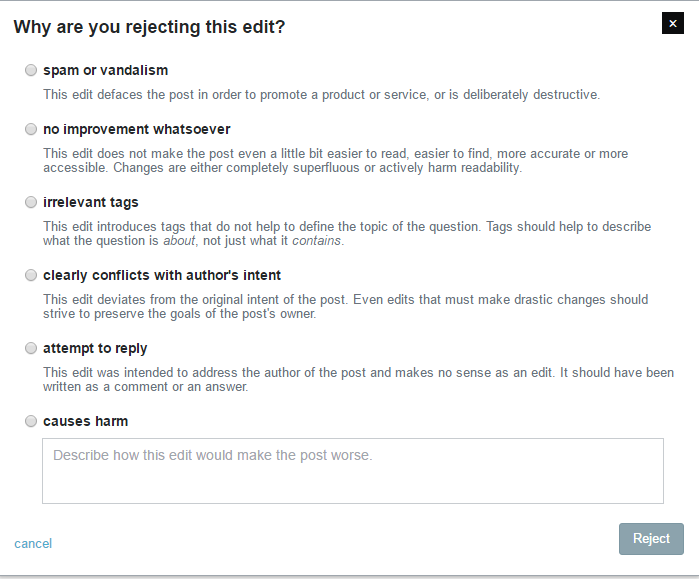 The official guidelines are here; https://scifi.stackexchange.com/help/privileges/edit but honestly, as long as you use common sense, you're always going to be OK.
Is it acceptable to substantially add text to a post when editing? What's wrong with this title construction? Was I right to roll this edit back? Why was this edit to hide a plot spoiler rejected?